As we previously reported, Google invested in Zynga to form the cornerstone of Google Games, which Eric Schmidt somewhat confirmed will launch later this year. 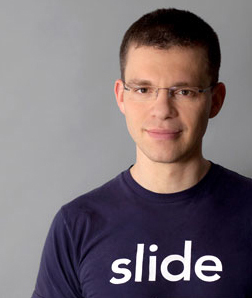 No word on whether Slide founder Max Levchin will be joining Google or what his continuing role will be. $182 million is a nice exit no doubt, but it’s a come down from Slide’s $500 million valuation in 2008. And Levchin has said many times that success to him was Slide becoming bigger than PayPal. Looks like it hasn’t. But it’s still possible that Levchin—who was the first investor in Slide too—is making a comparable or bigger amount personally from this sale.